Colleen Brubaker, a homeownership counselor with Mid Michigan Community Action for over seven years has been awarded the 2011 Counselor of the Year Award by the Michigan State Housing Development Authority. The award recognizes the efforts of a counselor who goes above and beyond, who has overcome personal challenges or who has made on impact in their community. Colleen was selected from 220 counselors throughout the state for her exemplary skills in helping people overcome adversity and achieve their goals. She can go into a room with no preconceived notions, no judgments, and their best interest at heart. Colleen provides homebuyer education, credit counseling, Financial Self Sufficiency and budgeting to hundreds of families across eight counties. Many of the people that she has worked with have been able to purchase a home with assistance from the Individual Development Account program. “Colleen truly listens to what the client is trying to achieve and helps them determine realistic goals,” Deb Schafer, Mid Michigan Community Action Outreach Services Assistant Director, said. “She provides clients with the tools to move forward in their life journey and empowers them,” Schafer said. She has shown great commitment by attending numerous trainings to remain up-to-date on ever-changing industry standards and is very motivated to be a lifelong learner. Colleen has a special gift of relating to her clients by pulling from her personal experience. She has counseled 800 families over the past seven years and many have made life changing decisions based on her sound financial advice. Mid Michigan Community Action is proud to have Colleen on our team. 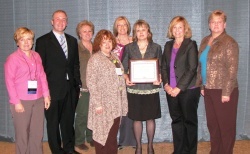 The award was presented at a luncheon at the Michigan Conference on Affordable Housing in Lansing.